Thank you for allowing me to serve you today. May God bless your life in such a way that you will be compelled to share your blessing with others through The Little Things”. We believe that when a gift is given, whether big or small, it can make a world of difference. Your challenge is to make even a small difference in someone else and spread the love as we enjoy the small blessings of life. The Little Things…I cannot say enough about this. What an incredible experience. I’m honestly not sure if the recipient of these or if the giver walks away from the experience more excited. I know I have been having a really rough time lately, and the last day or two have just been heartbreaking in different ways. So, as a way to focus on something else – and because I wanted to make a difference, I remembered our little campaign. I decided to be a part of this. I didn’t do anything spectacular, I simply paid for the person behind me in line’s drink at Starbucks. As I drove away, the amount of joy it brought in that moment was unbelievable. I know the $4 and change that I gave did not change the world, but it certainly impacted mine by just reaching out. It sometimes really is the little things that have the potential to make the biggest difference. Take time today to figure out a way to become involved with this. You may just find yourself touched in ways you wouldn’t have imagined. Today, I was having some trouble keeping my mind focused on Him. So, what did I do? I pulled out another card, and went on a mission. Sharing this joy with others is REALLY impacting me and bringing such strength. Today I embraced the spirit of this season and with these little red cards (The Little Things) in hand, I went out, set on making a difference. As I explored, I saw a new business, right in the heart of O’Fallon. A cupcake and coffee shop. Who doesn’t need that? So, after I purchased my own goodies, I left enough cash to buy the next person some sweet treats. I have no idea what the reaction was or will be from the recipient of this little gift, but the shop owner and workers were touched. Their reactions alone made it all worth it. They mentioned how “it is just so nice…a sweet thing to do.” We had the opportunity to talk about God, and also about Skyline. “I have never seen such love from a church.” That is a comment I will take with me and keep in the back of my mind. What an experience. 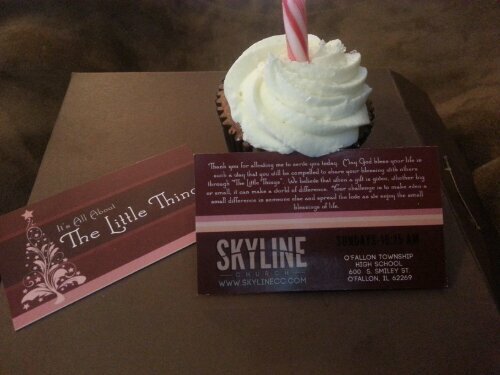 Thank you Skyline Church for this opportunity to make even a small impact in the lives of people around us. Our Journey didn’t end there, however, as we continued our mission to bless the people of O’Fallon with of all things…..QUARTERS. A little change in the coin return of a vending machine (who doesn’t like finding some change), $.75 taped with a card at a gas station air pump (why do we have to pay for air? ), $1.50 left behind at a car wash, some quarters strategically placed in the shopping carts at Aldi’s, and my favorite….quarters left in the bubble gum machines at Wal-Mart. We did reap a harvest of smiles and “thank you’s” in the schools, but our other “Little Things” were done anonymously. I can only imagine what might go through those people’s minds…especially the kids at the bubble gum machine. The image of their smiles make all the difference in the world for me. The entire scope and purpose of this post is to encourage you to dig deeper. Join in on this. If your church doesn’t have a “Little Things” sort of campaign – create one! You really have no idea how something small can be life changing. But, what has become more important than anything else in this equation is that it’s often the giver that is touched and moved more than the receiver. Give it a try. I’d LOVE to see your stories. Please don’t hesitate to share how this (or something like it) makes a difference in your life or community. As always, you can feel free to use the “Contact Me” page OR posting directly in comments. Keep this going! Very recently, I made a post about God and coincidence – as it related to praying for my car, and watching it come back to life! This morning at church, something happened that allowed me to ask the same question: God or coincidence? As I was preparing to video our church service, my camera decided it wanted to test my faith! (Before you decide it’s time to cart me off to the loony bin, I know it is an inanimate object not really plotting against me!) This said, I set my tripod up, and attached my camera. Just as I do ever other week. This time, however, things did not go as planned. My camera jumped right off my tripod, landing not so skillfully on the concrete floor! Looking it over, I determined it wasn’t irreparably damaged! However, upon turning it on, all it showed was a bright screen full of fine static. It would not record, and showed no images or videos saved. Okay, so this is not good. The service was to start in less than a half an hour, and I had this non-working camera. Not great. It was right then and there that I decided to pray. If nothing else, I knew prayer would do no harm. I did, however, have faith that God could and would work this out. So, I turned my camera back on – nothing. I then felt as if I heard Him say to focus on the light. Somehow, I knew to find the brightest light source around. So, I did that. Again, nothing. I kept feeling like that was the answer…so, once again, I aimed it at the light, and proceeded to try and focus. As I did that, the thing started working. All files that were there previously (but were showing gone) were there. All functionality had been restored to my camera. With minutes to spare before starting to record, my camera was fully operational – as if nothing had ever happened. God or coincidence? I’m going to go with God on this one as well. It just instilled in me that He cares about all things. I am also going to take it one step further. I looked at this as a practical example of a spiritual principle. Think about the following example. Say you fall down. It’s easy to feel broken, and even moreso – easy for things to not feel or work right. What was once there, cannot be found. You may feel broken, scared or like life will never work again – like nothing will be the same. However, my encouragement to you is this: If you will keep your eyes focused on Him, and – no matter what the circumstances seem like – keep adjusting and re-focusing on Him, things will eventually fall into place again. Broken pieces will be restored. Peace will be found, and life will be alright. With God as your focus, everything else seems to fall into place. Look to Him and just know that He is in control. No matter what “this” is, KNOW that He’s got this! You will often hear me talk about praying for the people God has in leadership positions – and in this case, pastors everywhere. The following are some personal guidelines that I keep in mind when praying for the leadership at my church. Where there are any names, you can substitute your own. This is by no means a complete list. For me, sometimes it helps to have a focus to my prayers. First, let’s pray for God’s heart for Pastors Lance, Scott and Chris – and their families. Remember to not speak critical of them, but serve them with love through the ministry of prayer. Pray for them continuously throughout the day. Pray for their marriage and families to be blessed. Pray for a Shield of Protection from spiritual attacks, from criticism, and pray for their physical health. Pray for a strong prayer life, and personal relationship and intercession for others. Pray they will be guided by God, and hear and obey His voice. Pray that they would not be led into temptation, and that they would resist the enemy. Pray for their teaching, preaching, and leading Skyline in worship – pray also for the presence of God. Pray for the peace of God to rule their hearts. Pray for favor with both God and man – with many open doors to share Jesus. Pray for a continuously supportive and loving church family, that they mature and grow in Christ, and they continue to have a passionate vision to reach the lost. Pray for continued provision for the church vision, along with provision for their home and family. God’s Answer To Prayer – Or Sheer Coincidence? Have you ever found yourself in a situation where you prayed and believed God for something – and your prayers were answered? If you answered yes to this question, did you just KNOW it was an answer to prayer, all the while having well meaning friends or family stress that it was just a coincidence? While people will believe what they want with reference to coincidences, I’m inclined to believe in a God larger than life – who listens to the prayers of His people – and cares even about the small details of our lives. Holding true to my character, I have a story to tell. My black Friday was anything but normal. Today, I did not go out shopping. I have long since decided that my sanity is worth more than that! I did, however, have to leave the house. I was on my way to pick up the kids. (They were visiting family.) As I was driving, my car started acting strange. It was as if the accelerator was malfunctioning. I would push the gas pedal, and my car wouldn’t respond. The engine would rev up, but not accelerate. It’d slowly pick up speed, but it’s like the timing was off. Then, if I let my foot off the gas, it would do nothing for 2-3 seconds – then would go about slowing down. It made driving interesting, but not seemingly unsafe. I did a system check, and all systems were a go. No errors or problems detected. This was until I got about 5 minutes away from their house. I wasn’t sure what to make of it (other than my car was not cooperating) – the little wrench symbol lit up. Great, a car issue. Then, the words “CHECK TRANSMISSION” came up and glared at me. Because it was dark, and freezing outside, I opted to keep on driving. As the drive ended, and I reached my destination, I went on with life as normal. This was until I tried to leave. I packed up the kids, and started my car. As I put the car in reverse, pressed the gas pedal, and attempted to back up, my car (parked on a hill) only wanted to move forward. I turned the car off, and back on. The error lights and transmission wording kept coming back. Lovely, I was now stranded across state lines. Not how I enjoy spending my day. We waited a while, and tried again. And again. To no avail. It was apparent that my car was not going to cooperate on it’s own. So, we called our roadside assistance folks, and got a tow truck to come on it’s merry way. Just to make sure, we tried starting it and attempting to back up. Again, didn’t work. As we were talking, I explained my strong desire to have my car closer to my house for repairs. I just really wanted a tow truck driver who could transport across state lines. That’d make life easier all the way around. So, I was told a story about the faith of a group of people trying to catch a flight. They were on standby, three tries, and three failures. They HAD to make their destination, and so they HAD to be on this flight. They prayed and KNEW God would go before them to prepare a way. They had the faith that, even though the airline told them there was NO WAY that they were getting on that flight, they were. Long story short, through a series of events, they got on that particular flight. God took care of them, and they made it to their destination without further delay. All I mention that story to say is that (as I was talking on the phone) I realized that God can work out situations on our behalf. Situations that seem like they have no other hope…no way out…He is able. So, right there on the phone, we prayed and asked God to help me get my car towed to a place close to home. However that needed to happen, we had faith that He would do it. So, as I got off the phone, it was time to wait on the tow truck. As I waited, however, I had another idea. I took those moments to just sit in His presence, and listen — to be quiet before Him. I felt such peace, and such gratitude for all He’s done in my life, and all He is going to do. As I sit, I began to talk to God. I told him my desires…and that I loved Him and would trust Him regardless of the outcome. Then, as my faith grew and was strengthened right there in that moment, I was bold with my faith. I expressed the desire to be able to drive my car home myself – for my car to be fixed, as if miraculously. At first, I laughed at myself – thinking how crazy it must sound to God. But, really – who is God, that we limit Him? He’s able. I kept hearing the words – My child, I am able. So, I didn’t know what would happen, or how it would get fixed, but tried starting and making it move again. Nothing. Still, my faith remained. I wasn’t sure how God was going to work in this situation. The tow truck driver arrived, and asked what the problem was – and what all was going on. I explained the course of the day, and what it was doing – or rather NOT doing – and filled out the necessary paperwork. As I finished telling him of my car woes, I completed the story by telling him that my car was going to respond differently this time. It would start and run, and accelerate like normal. No problem. (He was concerned, figuring out how he was going to get it out of the driveway, seeing as how I was parked on a hill (away from the road behind), that he would never get it out. So, I told him not to worry it would reverse and be fine, and that God was going to take care of me either way. I’m pretty sure he thought I was looney. I didn’t care. What followed next was nothing short of God. He sat in the car to see what it felt like, and – lo and behold – it started fine, and as the accelerator was pushed, the engine reacted just as it should. I then checked for the error messages, and there were none. He backed the car out of the driveway and drove it to where the tow truck was parked and waiting. As a precaution, we were still going to send it on it’s merry way, and get it checked out. Then I had a gut check almost. I sat there and realized God had answered my prayer, and my car was healed. I joke, but I believe it to be true as well. Against the advice of my inlaws and the tow truck driver, I told him that I was going to drive it home. He tried to convince me that it would just react the same way again when the engine warmed up all the way. Everyone indicated the whole “best to be safe than sorry” routine. I, however, felt strongly urged to act and react in faith. So, I stood my ground, and sent him away. I got the kids packed up and, after a little while, went to start the car again. All was well. As I drove home, I thanked God for His faithfulness. My car ran smoothly, and like nothing had ever gone wrong. It accelerated fine, and drove like it did before these issues. You may call it a coincidence. I call it God in action. Either way, I am grateful to God for keeping my family safe, and for getting us home safe, sound and in a car that works! Tech Support: Yes, Ma’am…. how can I help you? Customer: Well, after much consideration, I’ve decided to install Love. Can you guide me though the process? Tech Support: What programs are running, ma’am? Tech Support: No problem, Love will gradually erase Past Hurt from your current operating system. It may remain in your permanent memory, but it will no longer disrupt other programs. Love will eventually override Low Self-Esteem with a module of its own called High Self-Esteem. However, you have to completely turn off Grudge and Resentment. Those programs prevent Love from being properly installed. Can you turn those off, ma’am? Tech Support : With pleasure. Go to your start menu and invoke Forgiveness. Do this as many times as necessary until Grudge and Resentment have been completely erased. Customer: Oops! I have an error message already. It says, “Error – Program not run on external components .” What should I do? Tech Support: Don’t worry, ma’am. It means that the Love program is set up to run on Internal Hearts, but has not yet been run on your Heart. In non- technical terms, it simply means you have to Love yourself before you can Love others.